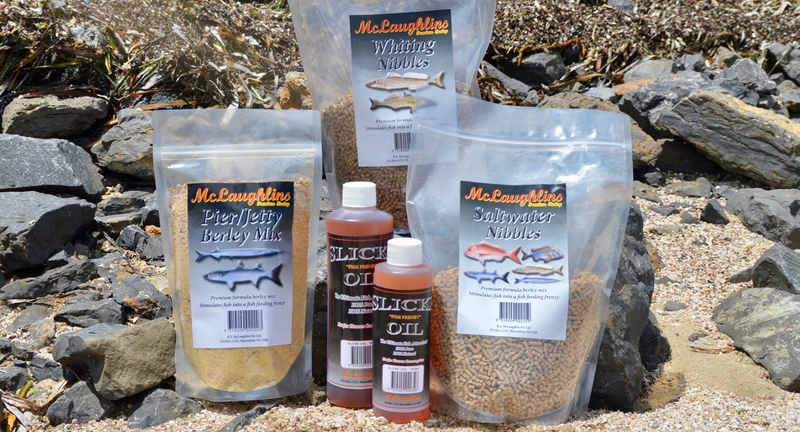 McLaughlin’s Bait and Berley have been producing quality bait and berley products since the late 1940s. During this time they have constantly worked to further improve the range and quality of the items they produce. In 2018 they introduced their latest innovation – the Advanced Formula range of berleys, which builds upon the success of their popular Premium Berley range. McLaughlin’s Premium Berley has always had secret ingredients and smells to attract fish to it. However, as the name suggests, the Advanced Formula range has upped the ante. McLaughlin’s have managed to further enhance the range with more natural flavours, and have added colours to make it easier to see the berley trail behind the boat. The range was developed by Juro Oz Pro Tackle, and I talked to Rick Massie from Juro to find out more. He said that it has taken a number of years to get the process of drying and colouring correct to the point where they were happy to release it. 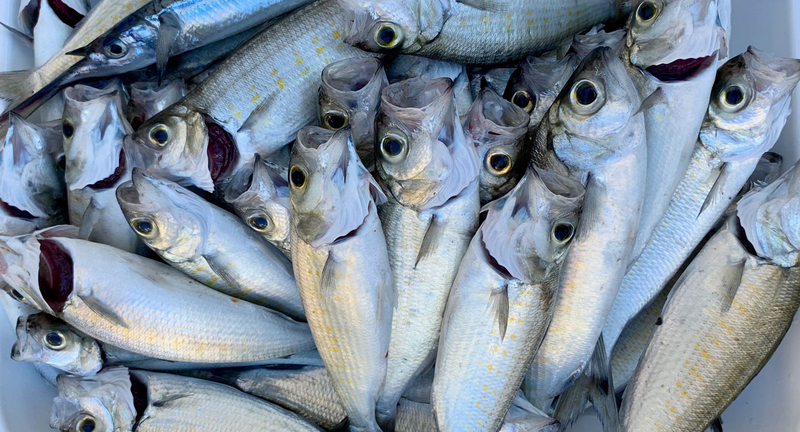 Using berley is not something that I regularly do, so I thought I would speak to Jamie Smith, the fishing specialist at Melbourne Marine Centre, for a few tips on targeting King George whiting and garfish. The store stocks the Advanced Formula berley, and Jamie has had quite a bit of success on these species. His advice was to keep it simple: the berley alone will do the job and bring the fish to you. He recommended using a small berley dispenser just below the surface if you want to target garfish, or one closer to the bottom if you’re whiting fishing. McLaughlin’s also does a product called Slicks Oil, which can be added sparingly in with the berley to give it even more punch. Keeping it simple sounded good to me. The Christmas holiday period was my opportunity get out and give the products a try. 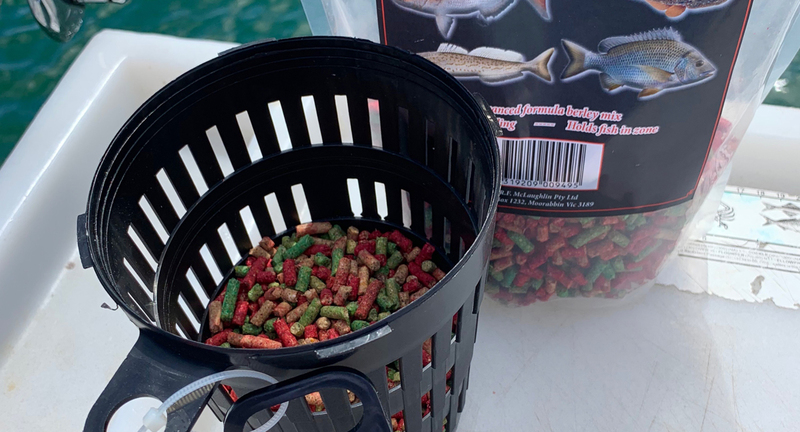 I had a bit of a mix of the old and the new – Saltwater Nibbles, Whiting Nibbles, a Pier/Jetty mix, a small Tuna Log and Slicks Oil from the trusty Premium range, and Green Lip Bites, Mixed Bits, Pink Bits and Big Red Nuts from the new Advanced Formula range. Juro Oz Pro had also sent me a small bucket. As far as I was concerned, the fish didn’t stand a chance. Mother nature didn’t read the script, however. During most of my holiday it was blowing 25-30 knots, so it was matter of taking advantage of any small windows of opportunity to get on the water. 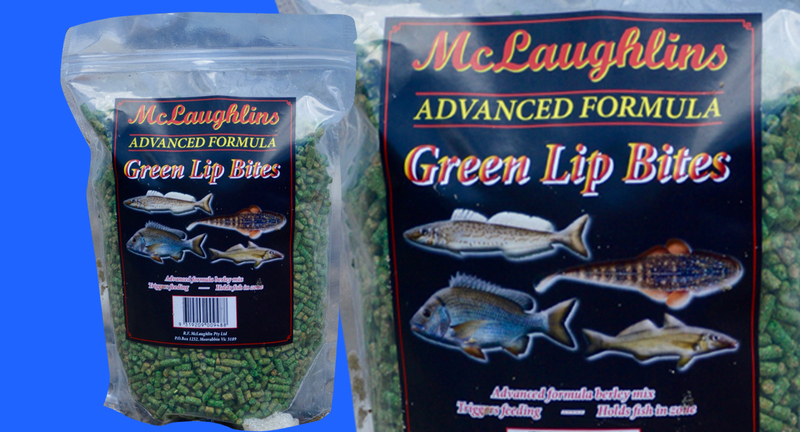 McLaughlin’s Premium Berleys and Baits have been around since the 1940s, and have developed a reputation for quality. Fishing for garfish and tommy ruff (Australian herring) is very popular along much of the south coast of Australia, and on my Christmas holiday it was obvious that I wasn’t the only person waiting for a weather window. When we arrived, the boat ramp was bedlam, and plenty of boats were anchored and berleying in all the likely areas. It was a matter of finding a free space and joining in. I started with the Mixed Bits pack and no oil – keeping it simple, as Jamie had suggested. I wasn’t sure how well we would do considering the number of boats around us. I needn’t have worried though, as within minutes there were plenty of tommies making their way up the berley trail. Generally the garfish are not too far behind, but on this day we could see them, but couldn’t get them to bite. We ended up getting a good bag of tommies and only one garfish. We had, however, done better than most. Chatting to other anglers, many had struggled to attract anything at all. Not a bad outcome after using the berley for the first time. King George whiting were the next target on the list (the weather windows were few and far between). As we were fishing much deeper water, I used a two berley pot system. One pot was close to the bottom with Green Lip Bites and a little Slicks Oil in it, and the other pot was on the surface with the Mixed Bits and no oil. ‘Activity breeds activity’ was my theory, and after only getting one fish from our first location, we made a move and found some hungry fish. 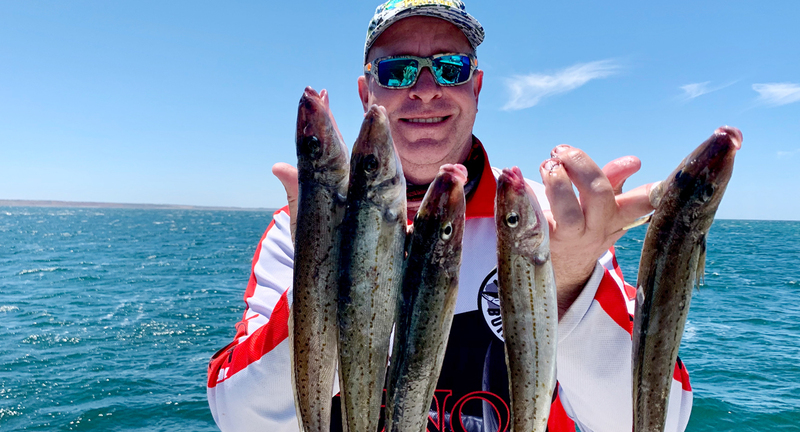 One thing with king George whiting is when they are biting you need to have a bait in the water, because they may not bite for long. After an initial flurry, things went quiet and I was wondering whether we should move. At that point I noticed that the berley trail from the top bucket no longer had fish in it, mainly because there was no berley left in the pot. A quick refill and redeploy had the tommies excited again, and a few more whiting hit the deck. Unfortunately for me I only had one more outing, and it followed a very similar scenario – we got a berley trail going mid and top water, created some activity and bagged a few fish. I used either the Green Lip Bites or the Big Red Nuts in the bottom pot, and it didn’t seem to matter with the top bucket. After that session I had to head back to work, but the family stayed behind and managed some more successful outings. The timid garfish eventually fell for the trap, and the ever-present tommy ruff just couldn’t resist a good berley trail. The windows of opportunity were only brief for the author, but he was pleased with the result of a few hours on the water. You can’t deny that the McLaughlin’s Berleys work. You can see the fish working up your berley trail, almost eating it from the berley bucket. At times I wondered if they preferred eating the berley rather than the gents or pipis I was using for bait. But that is what berley is all about – creating the activity for the angler to take advantage of. One thing to remember is to not overfill your berley bucket. The berley expands as it breaks down, so a little can go a long way. When it comes to berleying, keep it simple and remember that a little goes a long way. As well as that, just let the wave action do its job. Shaking the bucket may bring on a flurry of activity, but you want the fish to work up the trail you have created and then take your baits. Shaking the bucket and releasing big volumes of berley can also excite undesirable species. As the saying goes, ‘a little bit often’ is the way to go. A bit of preparation goes a long way. The McLaughlin’s berleys come in resealable bags and tubs, and it pays to store them out of the sun and make sure you seal them properly. This will ensure they’ll stay fresh and won’t attract pests. Fill your berley buckets before you get on the water. That way, once you have reached your spot you can deploy the berley and get the system working while you get your rods ready. As much as I have focused on the berleys themselves, Juro Oz Pro covers the complete system, from the berleys and their dispensers (small, large and a weighted heavy-duty pot) to the terminal tackle needed to catch the fish you are targeting. 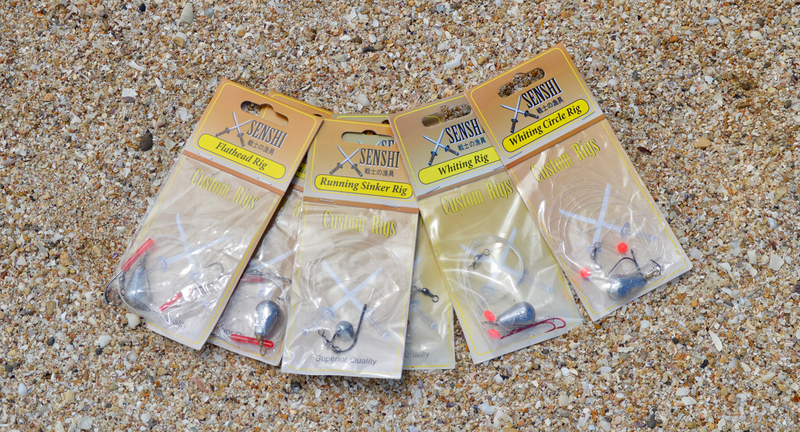 Senshi Custom Rigs avoid the hassle of creating your own rigs, and the 12 rigs in the range cover most of the popular target species. They are well made and the hooks are super sharp. 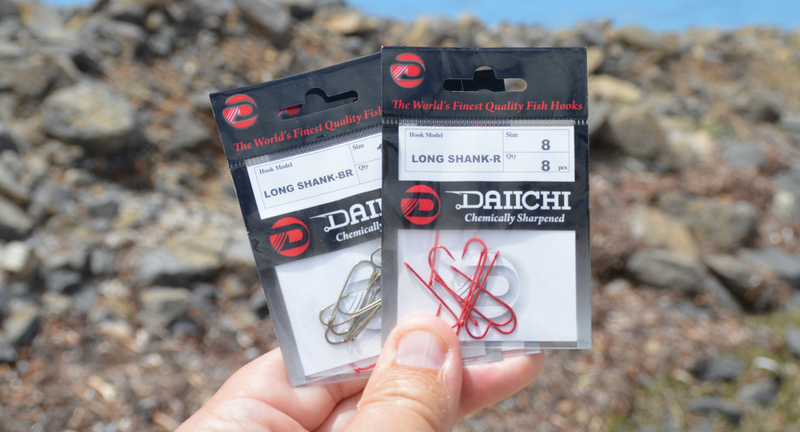 And then there are the quill floats, float stops, split shot, berley feeders and, most importantly, their range of Daiichi hooks. Using good quality terminal tackle that is correct for the species you are targeting can make a huge difference to your results. It was hard to choose a favourite from the Advanced Formula range, as they all worked, but in the end the Green Lip Bites came out on top. The boat ramp after a day’s fishing can be a great place to glean information. Stories about the fish that got away or how good the fishing was are commonplace. Or, as was the case during my holiday, “wow the fishing is tough”. That’s not how I felt though. Yes, conditions were difficult, but we were able to take advantage of the small windows of opportunity and catch some fish. So was it the berley making the difference? Well, it certainly wasn’t my knowledge of fishing with berley, because I had hardly ever done it before. I believe that the quality of the Premium and Advanced Formula berleys, and the terminal tackle we were using, gave us the edge. If you want to see the full range of products you can check them out at www.jurofishing.com or ask for them at your local tackle store. 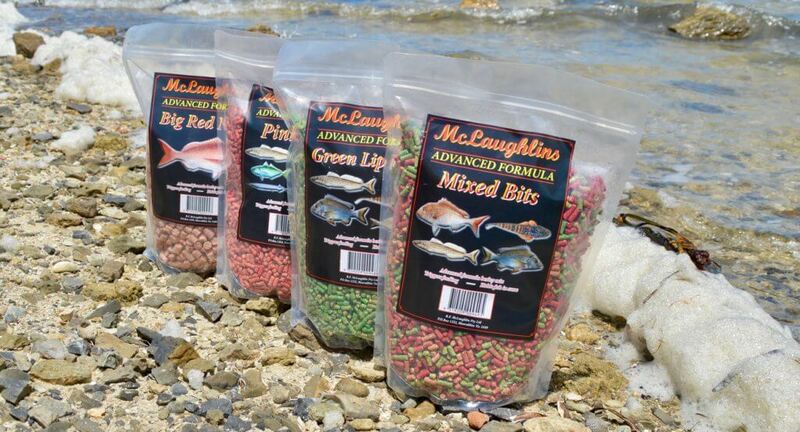 • Advanced Formula range – includes Big Red Nuts, Blood Bits, Green Lip Bites, Mixed Bits and Pink Bits, available in a 1.5kg resealable bag. Big Red Nuts and Mixed Nuts are also available in a 5L bucket. • Premium Berley range – includes Bream Nibbles, Freshwater Nibbles, Pier/Jetty Mix, Saltwater Nibbles, Trout Food, and Whiting Nibbles, which come in a 1kg resealable bag. Premium Berley Snapper Nuts are available in a 4L tub. • Tuna Berley Logs – compressed tuna/tuna oil logs, available in three sizes. • Tuna Tossers – compressed tuna/tuna oil nuts, available in 1kg re-sealable bag. Juro does more than just make quality berleys. Their range of hooks, rigs, floats and accessories are well worth looking for in your local tackle store.